Cobblers assistant manager Alan Knill has confirmed the club do intend to recruit new players in the January transfer window. 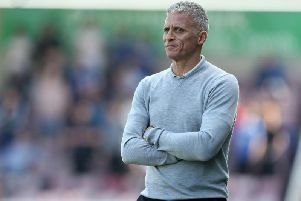 And Chris Wilder’s right-hand man says not all of the players on loan at Sixfields will be sent back to their parent clubs in the next month. Goalkeeper Jordan Archer will officially return to Tottenham when his temporary deal expires on January 7 and midfielder Ollie Banks was recalled by Chesterfield this week. Midfielders Joel Byrom (Preston North End) and Stewart Murdoch (Fleetwood) and defenders Tom Newey (Oxford United) and Danny Alfei (Swansea City) are on loan with Northampton until the New Year, while winger Kaid Mohamed (Port Vale) is on a season-long deal. The discussion about January transfers has, to this point, focused on player departures but Knill said the club will be in the market to add to the squad too. “Our form says that we need to do something,” said Knill. “We are definitely looking for players in January. John-Joe O’Toole is on loan at Southend United and there could be renewed interest in 18-year-old striker Ivan Toney, who was close to a £700,000 move to Wolves earlier this month. It is not known whether either would be replaced if they were to leave, and Knill says the defence is the main area of concern at present. “There are still an awful lot of games to play this season,” he said. “At no point have I really thought about the teams below us, I’ve always been looking up at the ones we can catch. “We don’t look at it as being a case of being in a fight, we think about the things we know we can do well and concentrate on those.